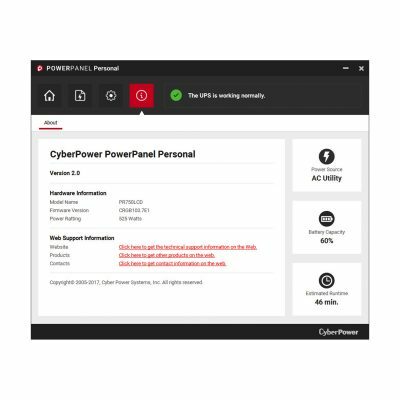 PowerPanel® Personal is FREE software that features a user-friendly interface for controlling and monitoring any CyberPower UPS system through the USB or serial port. PowerPanel Personal can send email notifications when power events occur to keep you informed of power conditions at all times. 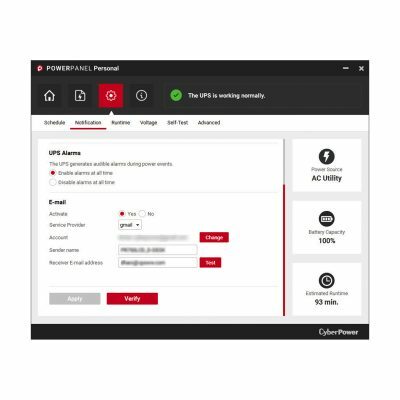 The software monitors and tracks power consumed by the connected equipment to the UPS, and the user is able to see energy consumption and equivalent CO2 emissions. 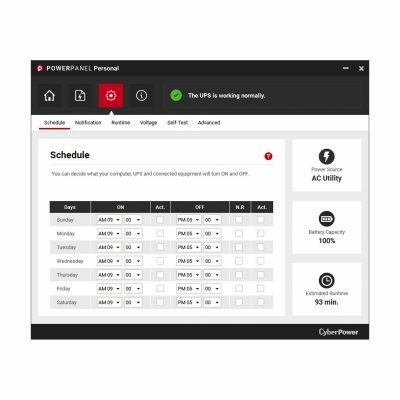 PowerPanel® Personal provides configurable settings for managing automatic shutdowns during power outages, scheduled shutdowns, and restarts. 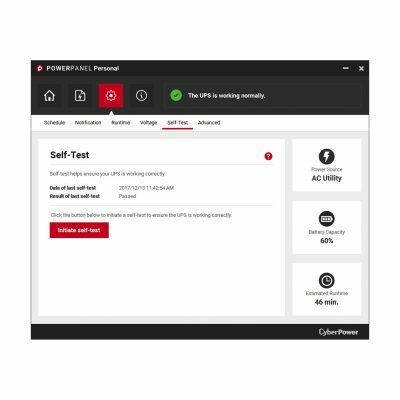 The software displays important UPS operating information such as operating voltage, battery capacity, runtime, and load; in addition, it offers a self-test function, adjustable alarm settings, and more. This software helps protect your data, computer system, components, and peripherals. It is compatible with Supported Operating Systems: Windows Server 2016 64/32bit, Windows Server 2012 R2 64bit, Windows Server 2012 64bit, Windows Server 2008 R2 64/32bit, Windows Server 2008 64/32bit, Windows 10 64/32bit, Windows 8 64/32bit, Windows 7 64/32bit. 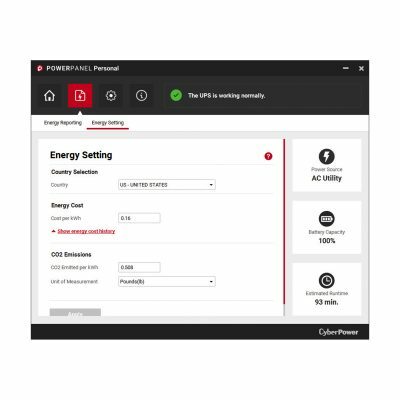 Provides an easy-to-use, intuitive user experience. 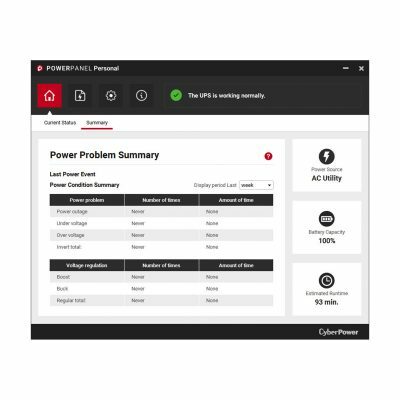 When the connected UPS detects a power outage, PowerPanel® Personal automatically triggers the computer to gracefully shutdown to prevent data loss, data corruption, or equipment damage. PowerPanel® Personal allows users to setup email notifications to receive real-time alerts when the UPS registers a power event. In the event of a power outage, the user can configure the software to keep the computer running until the battery power runs low, or to shut down the computer immediately after a power outage to preserve the battery.